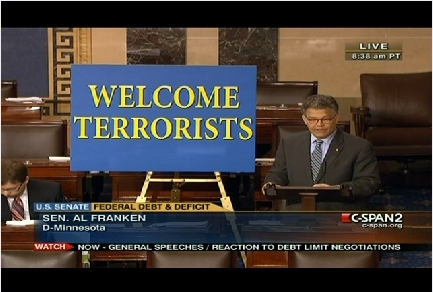 Franken aimed his theater of the absurd at those who believe the U.S. doesn’t have to raise the debt limit to avoid economic catastrophe. He couched it as black humor, but certainly not as comic relief in a House and Senate deadlock that economists say puts the U.S. at risk of a financial meltdown. “About a month ago, the Bipartisan Policy Center briefed members of the House Republican Caucus on the actual implications of the Aug. 2nd deadline — what we could pay, what we couldn’t pay,” Franken said. “…in the month of August, we could pay our debt interest, Social Security, Medicare and Medicaid, vendors for defense projects, and unemployment insurance — and that’s all.